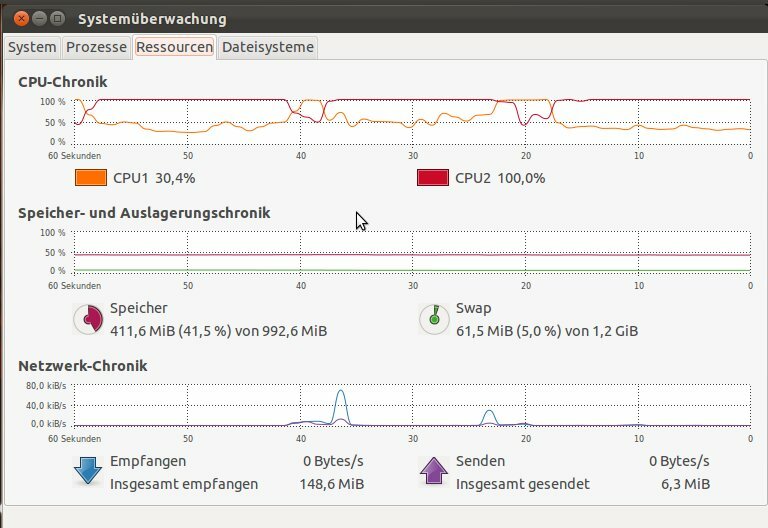 After Upgrading Ubuntu 11.04 to 11.10 on my Dell D420, there is always 100% CPU usage on one of the two processor cores. When core 1 has 100%, then after a couple of seconds core 2 has 100% and the other falls into idle. This happens all the time after the upgrade (core 1, core 2, core 1.......). Changing over to gnome window manager does not change anything, same happens when using the guest account. Today I have startet my laptop with a live stick of 11.10. Here I also have the problem, that one core always has a CPU usage of 100%. In this moment I recognized, that the problem seems to be process upstart-udev-bridge. According to bug #829980 and bug #850935 this seems to be a problem of a couple of users. With removed battery connected to AC, CPU usage goes down to normal. So what to do with this error? Tobias - thanks for reporting this bug. Please could you attach file /var/log/udev to bug 829980.